This book presents, in extraordinary detail, sixteen landmark cases that profoundly affect the protection of intellectual property rights in China. Written by six prominent Chinese legal scholars and jurists – including judges who themselves participated in these decisions – each case is fully described and analysed: the parties and their representatives, the basic facts, the facts ascertained by the court, the evidence presented by plaintiffs and defendants, the judges’ opinions with their arguments and reasoning, the unanimous conclusions, and the judgment, along with a wealth of deeply informed comment. Is a website within the definition of a ‘work’ in copyright law, and thus protected? How should the acts of uploading and downloading of works from the Internet be classified? Can the concept of torts be applied in the Internet context? What is the legal liability of an Internet service provider? How is a defendant’s ‘unreasonable conduct’ to be determined? Who is responsible for the determination of ‘artistic value’ – e.g., of clothing designs? In what a manner should packaging and decoration be regarded? How should the ‘author’ in copyright conflict cases be identified? How should an unauthorized web link be judged? When do separate components assembled to create a product enjoy copyright protection? 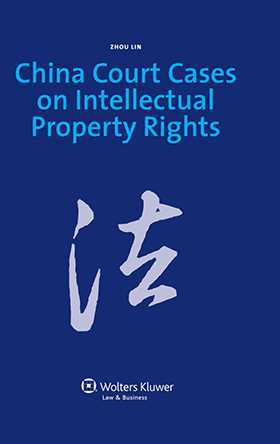 An introductory essay provides a detailed overview of the characteristics of China’s intellectual property law as it continues to develop, with attention to such factors as the specific laws enacted, the various courts and tribunals to which IP cases are assigned, the progress of a case, starting from filing to winding up, regulations, reform programs, and rules of evidence. The editor puts forward his own proposals – particularly in light of the so-called ‘interfering factors’ – on reform of civil trial style in intellectual property cases. It is difficult to overstate the value of this book to anyone involved in business dealings in China. With its authoritative expertise, abundant detail, and thorough elucidation of the salient features of developing IP law and practice in China, it will serve interested parties for years to come.